Highly designed and finely crafted ceramics, vessels, tiles, and public art features for the home, the hospitality industry, architectural spaces and beyond. Kala’s work demonstrates a unique reverence for fine craft and a commitment to precision and sustainability. A selection of sample work is included below, please contact Kala to inquire about custom ceramics, ceramic installations, and custom fabrication and design. Located adjacent to a glass wall on the ground floor of the hotel’s main entry, this 15-foot rendering of the Aquarius star map is a large-scale statement piece. Made of ceramic with bronze and black glaze and hand milled walnut, it elegantly floats away from the wall using a custom designed acrylic cleat system. 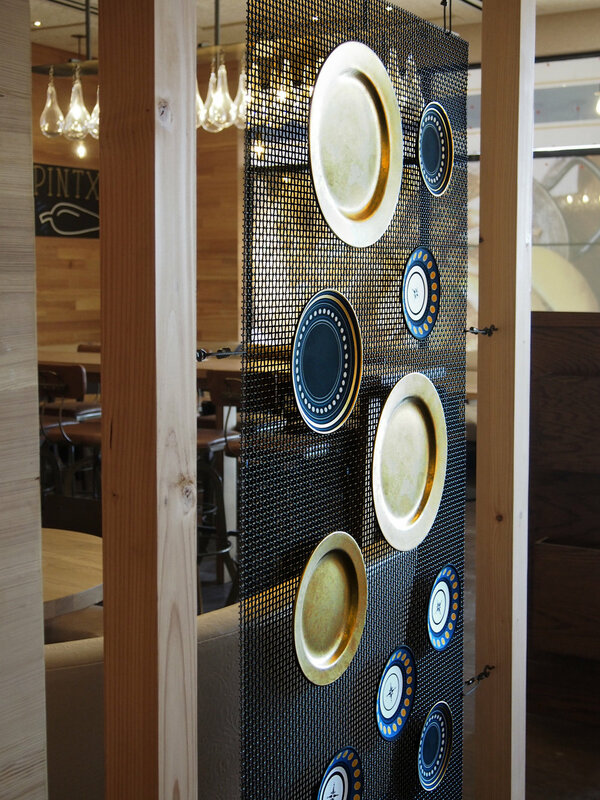 Detailed decorative plates attach with a magnetized system to create artful room-partitioning screens. The plates exhibit a contemporary approach to surface design, merging Mediterranean and Talavera ceramic traditions—each individually decorated by hand. The Shard plates emphasize the cultural and fine dining experience at Edge—a thirty-seat private dining room in downtown Sonoma. The plates are wheel-thrown porcelain with photographic imagery embedded into the glazed surface. The imagery of the shards capture the delicate designs originally painted on fine china by the client’s mother, which revives a sense of sentimentality into a functional dinnerware collection. The canapé plates were designed in collaboration with Chef John McReynolds of Edge and provide a sleek contemporary backdrop for the organic bounty that Stone Edge Farm & Winery are celebrated for. Designed as a wedding set for Kimberly and Ian, the hand thrown porcelain has Kala’s signature appliquéd geometric pattern enhanced with premium gold and platinum luster glaze. With Ian’s experience at a Michelin Star restaurant, it was prerequisite that the collection showcased his the food while making a statement on its own. Towering shelves of iconic vessels fill the room to create a dramatic grotto effect. The vessels are hand-thrown with black clay, painted with a black metallic wash and appear to be made of cast iron. Fabricated for the 2016 Google Zeitgeist Conference in New Mexico, the ceramic letters are twenty inches tall and are displayed off of a curved wall with a threaded hardware system. The glazed surfaces of the letters have a black and white crackle glaze and the numbers have a metallic multi-colored glaze as a result of Raku firing. Conjuring an industrial era NYC butcher shop and mercantile, these bottles and objet de l’art fill the antique European apothecary cabinets and barback. Made of ceramic and salvaged glass, metal, twine, wood, paper, and ephemera. Made in conjunction with award winning design firm, AvroKO.